The Philippine Association for the Study of Overweight and Obesity is to host the Asia Oceania Association for the Study of Obesity's: 6TH ASIA OCEANIA CONFERENCE ON OBESITY. This biennial event will be held from the 31st of August to the 2nd of September 2011 in Manila, Philippines. 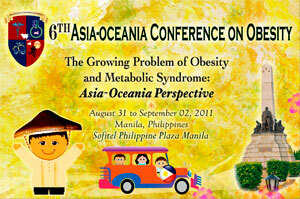 This congress on THE GROWING PROBLEM OF OBESITY AND METABOLIC SYNDROME: ASIA OCEANIA PERSPECTIVE, is a unique opportunity where researchers can share, interact, and learn about the many facets of obesity and the metabolic syndrome in our region.